ASP, Flash, and other Purple Ponies - Rachel Nabors, award-winning cartoonist turned digital storyteller. Awesome Corp. is looking for a web designer with the following skills: standards compliant code, ColdFusion, CSS, AJAX, JQuery, ASP, PHP, WordPress, Drupal, MySQL, Oracle, Flash, Actionscripting, Photoshop, Fireworks, Illustrator, Dreamweaver… …and so forth. They might even throw in InDesign or Quark Xpress, just for kicks! The truth is, unless the advertiser is a consultancy firm or web dev shop, they probably don’t need someone with so many skills. In fact, a competent person with such a broad skill set is hard to find because skills take time to learn thoroughly. Remember that experienced, veteran web monkeys cost more to employ than their juniors. 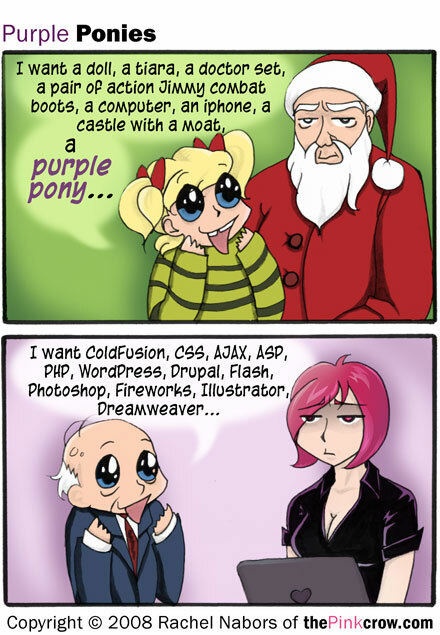 It’s supply and demand at work; they can charge more because everyone wants a purple pony. What will happen is that Awesome Corp will get applicants, some with resumes that list every one of those skills. Of those resumes, the veteran web developers and designers will be asking for more money than those who’ve been in the field for less time. The company will probably be more interested in hiring the cheaper applicants, because of course anyone experienced with all those skills isn’t going to be cheap! But Awesome Corp. may have actually ended up picking the more expensive option after all. Side story: Purple Ponies in real estate! People don’t just ask for purple ponies in web design; they ask for them in real estate, too! Many a time has my Realtor mother regaled me with stories of people in search of their perfect home on the mountain. They want a view, a stream or pond, near a road, but far from people, a fixer-upper cabin, a moat, a purple pony. Truth is, it is very rare to find all that in the mountains, and it is never cheap. Some of the clients’ specs are even downright contradictory (like Fireworks and Photoshop)! You get views on hilltops, but water and springs don’t crop up in high places. Without owning an entire valley, finding a view of the mountains and a creek in your backyard is difficult to say the least. But, some plots do exist, with the view, the cabin, the creek, the forest, the barn, etc. And do you know what? They cost a fortune because everyone wants the same thing! Purple ponies are by their nature very expensive. And even ones you think would be cheap, the “fixer uppers,” aren’t because everyone wants to fix them up. In much the same way, even a “fixer upper” rookie developer is going to cost more than they initially appear. What do you need? What don't you need? You don't really need a Flash developer. Will your site feature any games, music, or movies? No? Then you don't really need a Flash developer. In fact, if you answered yes to the above, go hire a specialized Flash developer, not a web developer. Flash is a world unto itself, and experience is needed to create such complex applications. But, if you're thinking about Flash mainly as a supplement for navigation and rotating banners, you don't really need a Flash developer. AJAX can do most of what Flash has been used for, and guess what? It does it better. Accessible, lean, beautiful and no plugins to download. PHP (down with ASP) Unless you have an ASP-based site, PHP is the future. Let it go. Just let it go. And even if you have a legacy site, if someone understands PHP, they will be able to comprehend ASP, too. If you need more than PHP can deliver, you need a database engineer. They shoot people who use ColdFusion, don't they? You can tell I'm not big into PHP's more commercial competitors, namely ASP and ColdFusion. PHP is opensource, easy to implement and configure, and it isn't manufactured by a company that charges too much for their products. Oops, did I type that out loud? But don't take my word for it. Inform yourself. Over at wikipedia is a list of ColdFusion's technical pros and cons. Be informed. Don't just go out and about spewing buzzwords in hopes that some hard-up, mad-skilled genius of a developer will land on your doorstep, begging for work. Do your research. Find out what you need. Solicit opinions on your project/position before you go out hiring willy nilly. A litte forethought now will save a lot of awkwardness. Get a second opinion. When in doubt, you can always pay a consulting agency for a second opinion. It could save you thousands in over-qualified purple pony salaries! So, do you have any tips of your own that you would like to pass on? Please share! The Three Minute Accessibility Test 3 WordPress Security Plugins you must have to keep hackers at bay.